Hi! 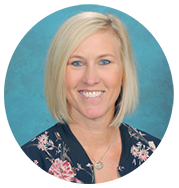 I’m Mrs. Melissa Jenican and I am so excited to be working here at Aliso Viejo Christian School! What a blessing it is to be at a school where I can express my faith and share my love of learning with students! I am married to my wonderful husband Eric and we have three amazing children: Carli who attends Chapman University, Camryn who is at Aliso Niguel High School, and Will who is in elementary school. We live in Aliso Viejo, so it is a joy to teach and live in the same community. I enjoy attending my children’s sporting events, going to the movies, reading, and most of all spending time at the beach! I come from a family that values education. Both my parents have their doctorates and were principals before retiring several years ago. I received my B.S. in Child Development from California State University, Fullerton in 1992 and my Multiple Subjects teaching credential from Chapman University. I taught elementary school for 10 years in the P-YLUSD before taking some time off to spend with my family. I am thrilled to be back in the classroom teaching second grade again! I love working here at AVCS and always look forward to a new school year where I get the privilege of welcoming a new group of children into my classroom and sharing my love of Jesus!